NETWORK FINALS: HAWAII 5-0 gained 0.1 in final numbers. CABLE HIGHLIGHTS: Discovery was in control of Friday cable, with GOLD RUSH steady at 1.12 and the premiere of lead-out THE WHEEL at 0.47. On Lifetime, BRING IT returned at 0.45, and THE RAP GAME was at 0.44. ESPN’s NBA doubleheader featured Boston vs. Atlanta at 0.43 and Detroit vs. Utah at 0.42. 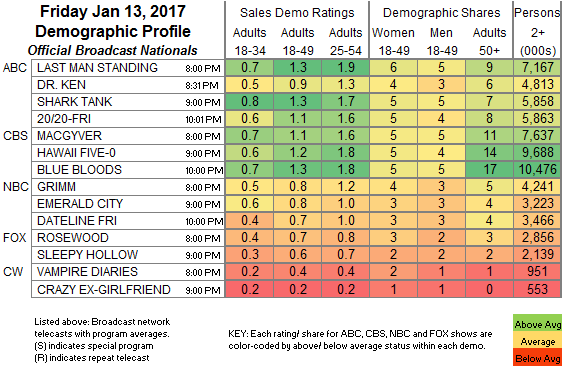 On Food Network, GINORMOUS FOOD and lead-out DINERS, DRIVE-INS & DIVES were both at 0.38, respectively up 0.04 and 0.02. HGTV’s HOUSE HUNTERS rose 0.04 to 0.37, HOUSE HUNTERS INTL was up 0.04 to 0.35, and MY LOTTERY DREAM HOUSE was at 0.29. Disney’s GIRL MEETS WORLD gained 0.04 to 0.35. A&E’s LIVE PD ticked down to 0.35. 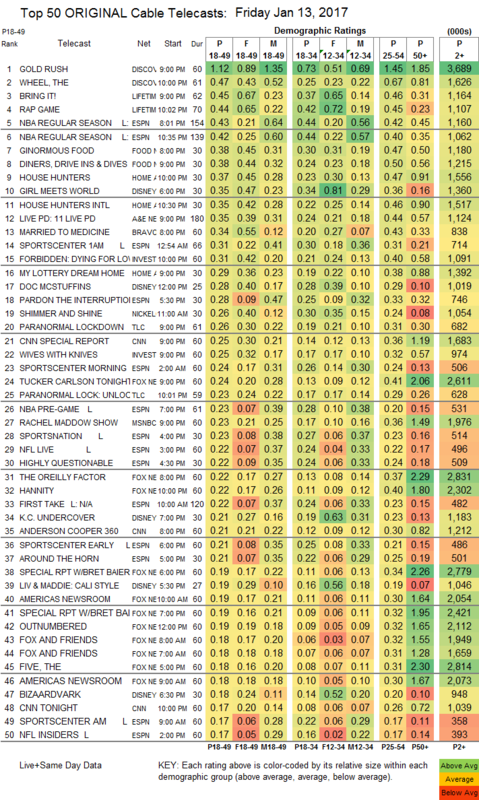 On Bravo, MARRIED TO MEDICINE fell 0.08 to 0.34. ID’s FORBIDDEN: DYING FOR LOVE ticked up to 0.31, and WIVES WITH KNIVES ticked down to 0.25. On TLC, PARANORMAL LOCKDOWN rose 0.07 to 0.26, and an AFTER-SHOW was at 0.23. On We, MARRIAGE BOOT CAMP dropped 0.05 to 0.16.